I am not sure if this is an age thing but I have reached the point where I couldn’t care less about people who gossip behind my back. I honestly think that there will always be good and bad people who talk about you. We are social creatures and gossip is a big part of it. I wouldn’t be a woman if I wouldn’t admit that gossiping can be a lot of fun at times and not all gossip is necessarily bad. However, there is an important distinction to be made between gossip that is harmless and gossip that harms others. I am a human being and far from perfect but I am also a role model in the corporate world who has to practise what she preaches. I ask myself: Is it true? Is it necessary? Is it kind? I can promise that if people don’t find an easy target in you, they will find someone else to whine and complain about, and you are off the hook. It won’t be fun to talk to you because you don’t engage in their complaints. 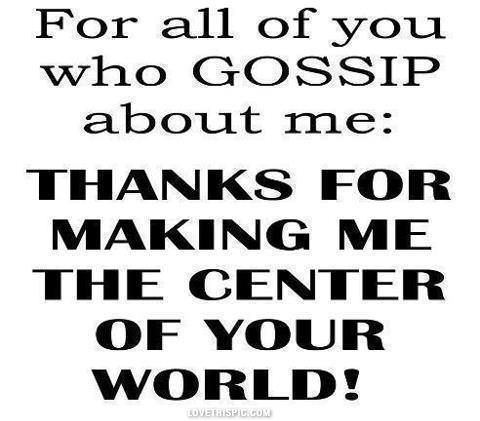 Just remember, people who gossip about others will also gossip about you. Shhhh….